U.S. Senator Ted Cruz, R-TX, speaks to supporters as he campaigns for re-election at the National Border Patrol Council Local 3307 offices Tuesday, April 3, 2018, in Edinburg. 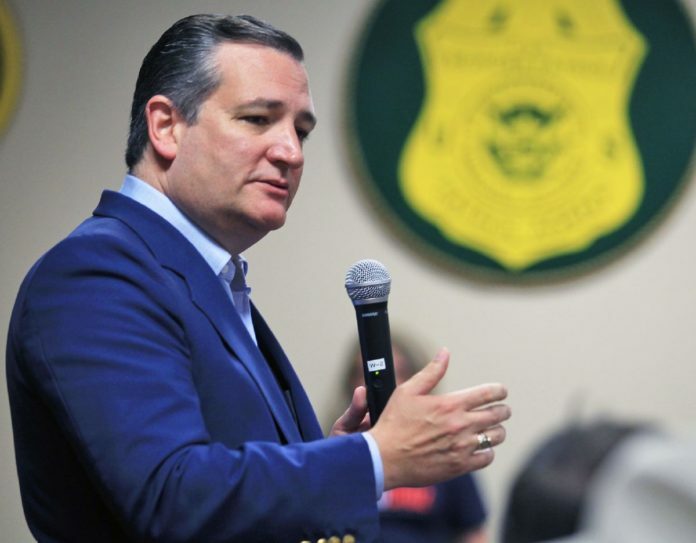 EDINBURG — A day after launching his “Tough as Texas” re-election campaign slogan, U.S. Sen. Ted Cruz praised law enforcement personnel seated nearby, many of whom made up the organization that issued Cruz an endorsement on Tuesday. The National Border Patrol Council, an 18,000-member labor union, hosted Cruz Tuesday at its offices here, across the street from the district office of U.S. Rep. Vicente Gonzalez, D-McAllen, who’s an ally of Cruz’s Democratic opponent from El Paso, U.S. Rep. Beto O’Rourke. Despite Cruz’s delight in engaging protesters, and their frequency at Cruz events in the Rio Grande Valley, there were none at or outside the rally. This was the council’s second-ever endorsement, following the group’s backing of then-candidate Donald Trump in his bid for president in 2016. NBPC President Brandon Judd, a 20-year Border Patrol veteran and frequent Fox News contributor introduced Cruz. He lauded Border Patrol agents in the room before telling specific anecdotes from Hurricane Harvey and the church shooting near San Antonio in Sutherland Springs. Cruz praised Paul Perez, president of the NBPC’s RGV chapter, for acting when the hurricane hit. Cruz continued commending law enforcement and calling them heroes. He honored the family of former Border Patrol agent Javier Vega Jr., who was killed in 2014 while protecting his family when they were fishing in Raymondville. Cruz and U.S. Sen. John Cornyn, R-Texas, co-authored a bill to rename the Border Patrol checkpoint along U.S. Highway 77 near Sarita after Vega. Cruz preceded this by proclaiming the strong need to enforce immigration law. But, he said, “that’s not who we are. In Texas, what brings us together is the shared values,” before listing what he believes interests the 28 million people here. Cruz told the story of Jeff Branick, the Jefferson County judge who switched parties last year and joined the junior senator for an event in Beaumont. He linked Branick to the Rio Grande Valley. “The Hispanic community in South Texas have been conservative Democrats for a long, long time,” Cruz said. The O’Rourke campaign tried to insert its presence at Cruz events, including the one in Beaumont on Monday, as well as the Edinburg rally. O’Rourke posted a Snapchat filter in the McAllen-Edinburg area that allowed users of the app in that locale to layer a cartoon of a frowning Cruz on their posts. The filter included a knock at Cruz’s presidential bid, which O’Rourke said diverted Cruz’s focus away from representing Texas in Washington. On Tuesday morning, two hours before Cruz’s rally kicked off, O’Rourke announced that he raised more than $6.7 million in the first quarter of 2018. This was by far O’Rourke’s largest fundraising quarter of his campaign, doubling any other three-month stretch yet. His previous quarters ranged from $1.7 million to $2.4 million. The fundraising, which his campaign said is more than any Democratic candidate nationwide, comes from 141,000 contributions. O’Rourke told the Texas Tribune later on Wednesday that about 70 percent of that money was raised within the state. “It’s a lot of money,” Cruz said after the Edinburg rally. “There’s no doubt that the far left is energized, and they’re angry — they hate the president and you are seeing Bernie Sanders liberals giving millions of dollars to Democratic candidates all over the country.